The Hoop: Real to entice Spanoulis? This is probably the beginning of a series of rumors about Panathinaikos that are expected to increase.. significantly. Stay tuned. There are quite a few contracts expiring this summer in Panathinaikos. One of them is the contract of Vassilis Spanoulis(1.93-PG/SG). 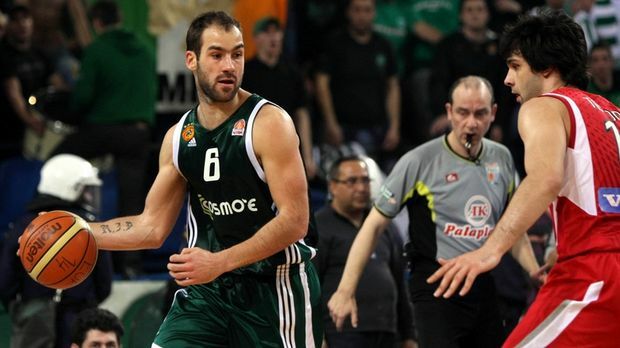 Spanoulis is expected to remain in Panathinaikos, or so everyone thinks. According to krepsinis.net, Real Madrid are interested in offering him a lucrative contract that will lure him away from Greece. It's not a far fetched rumor as Real Madrid have a lot of money and they are in dire need of elite players. Spanoulis has not made any references to the subject at all and the Greek media are careful not to delve there. The 27-year old combo-guard is currently preparing for the next round of the Greek play-offs. This season he has averaged 10.3 points 1.5 rebounds and 3.6 assists in 14 games in the Euroleague for Panathinaikos.